Dodgy doctors and wailing werewolves take centre stage in Full Moon Rising, a hugely popular horror-themed slot from Ash Gaming. This 5 reel, 20 payline game comes with multiplier wilds that can boost your payouts by up to 5x as well as a bonus feature that offers 20 free spins with up to 25x multipliers. Venture into the moonlit night from between 20p and £300 per spin. The setting for Full Moon Fortunes is a creepy looking Victorian-era graveyard – the symbols on the reels include lower value playing cards from A to J alongside a bullet, paw print and Dr Blackwood. There’s also an amulet, which can appear as stacked on all 5 reels, and the Full Moon Fortunes logo which is the game’s wild. It pays up to 500 coins and substitutes for everything bar the scatter. Look out for the full moon symbol – when it lands on reel 5, it can have a magical effect on Dr Blackwood, turning him into a werewolf and more importantly for us, into a multiplier wild. Any payline in which the transformed Dr Blackwood appears will be boosted by a multiplier which can reach 5x. The gravestone is the scatter – land 3 or more of these anywhere on the reels to trigger the Night of the Full Moon Free Spins feature. 3 gravestones will get you 1 free spin with a 2x multiplier. 4 gives 2 free spins with a 2x multiplier. 5 offers 3 free spins and a 3x multiplier. That sounds a little skinny but there’s plenty of scope to add courtesy of the pick me round that precedes the free spins – here you’ll be sent to a cemetery where you get to pick a selection of gravestones and in the process reveal more free spins and multiplier prizes. Up to 20 free spins are on offer here. The mysterious Dr Blackwood is the symbol you want to see during the feature as he’s a wild – land connecting line wins with the doc turned werewolf and multipliers of up to 25x are possible! Full Moon Fortunes is a fairly volatile slot with the variance on the high side of medium – expect some lean spells but home to make hay when you trigger the feature where the bigger multipliers are on offer. Gothic horror fans will love the gory visuals and creepy soundtrack. 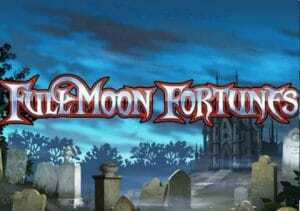 Players who aren’t fans of the horror genre, should find enough features on offer to still make Full Moon Fortunes a very playable slot. Get lucky with those free spin wilds and Dr Blackwood and the werewolves can leave you howling. If you like the theme, Immortal Romance by Microgaming is very good as to is Dracula’s Family by Playson.